Top women golfers can drive the ball farther than some men. LPGA stars Yani Tseng and Michelle Wie can hit the ball 270 yards using their drivers, and their success has a lot to do with technique. Lorena Ochoa, who retired from professional golf in 2010, also drove the ball long and maintains her power came from her hips and legs. Women golfers don't have the upper body strength of their male counterparts, but can compensate with timing and excellent form. Ochoa told "Golf Digest" in 2008 that women don't have to be big or swing super fast to get good results from the driver. Set up on the tee with your legs about shoulder length apart and the ball just inside your forward heel. 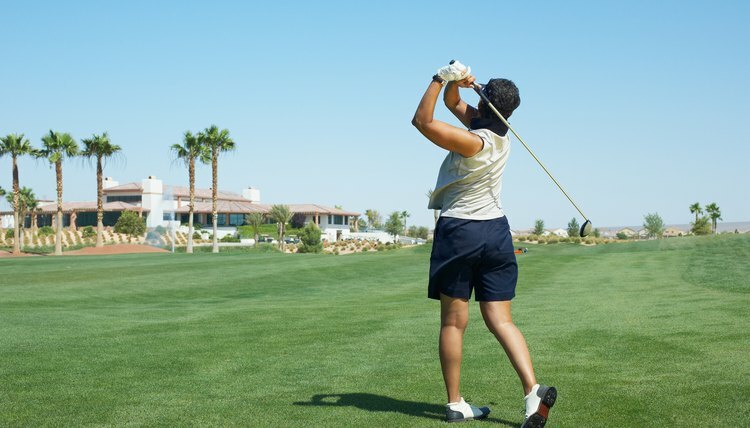 Allow your shoulders to turn naturally as you take the club back while keeping your left arm relatively straight. Keep turning naturally until your back is to the target and you've extended your hands up and around your body. Ochoa notes that when she's in this position she feels her body has stored energy by coiling, and she can deliver a powerful blow to the ball using her legs and hips. Hinge your wrists naturally at the top of the backswing. LPGA teaching professional Karyn Dunphy says that hinging your wrists adds power with the driver. She recommends keeping your wrists cocked as long as possible through the downswing and ideally unhinging them as the driver's clubface strikes the ball. The longer you can maintain your wrist hinge, the farther the ball will go if you hit it squarely, according to Dunphy. Maintain a stable lower body as you swing through the ball. That means you should not sway your hips during the swing. Dunphy maintains that as you uncoil from the top of the backswing your arms will naturally create clubhead speed and velocity, generating good distance once you strike the ball. Rotate your hips naturally as you complete the downswing and your follow through. Ochoa emphasizes allowing your legs and hips to pull you though the forward swing to a balanced finish.